by Liu, Cheng; Evett, Jack, Ph.D. 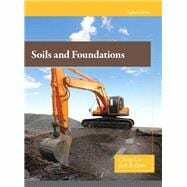 Ideal for beginners, SOILS AND FOUNDATIONS, 8/e presents all essential aspects of soils and foundations in as simple and direct a manner as possible. Filled with worked examples, step-by-step solutions, and hands-on practice problems, it emphasizes design and practical applications supported by basic theory. Throughout, the authors promote learning through the extensive use of diagrams, charts, and illustrations. Coverage includes: engineering properties of soils: soil exploration, compaction, stabilization, and consolidation; water in soil; subsurface stresses; settlement of structures; shear strength; shallow and deep foundations; lateral earth pressure; retaining structures, and stability analysis of slopes. This edition's new coverage includes Pressuremeter and Dilatometer tests, water flow characterization with Bernoulli's Theorem, dewatering, uplift pressure on dams, and subsurface stresses caused by overlying soil masses.